Saipan offers a wide variety of great dives. Listed below are the sites that are most commonly visited by divers, but its a big ocean out there and there's always new places to be explored. By clicking the Dive Site Name you will be linked to a site with more information about and pictures of the particular dive site that interests you. EAGLE RAY CITY (B)- Eagle Ray City was one of the most unique dives in Saipan. Rising out of the sand at a depth 30 feet is a rocky formation that on a good day would have up to 40 Eagle Rays hanging out. While divers held on to the rock Eagle Rays would glide overhead. For some reason the rays no longer congregate in the same spot. Eagle Rays can still be seen in Saipan. ICE CREAM (B)- A seamount located on the west side of Saipan that is home to eels and octopus. It is not uncommon for a couple of Eagle Rays to visit the site. This is a shallow dive with the base of the seamount at 50 feet and the top at 18 feet. LAU LAU BEACH (S) - With an easy beach entry and one of the largest reefs on the island, this is one of Saipan's most frequently visited sites. Lau Lau has an array of Wrasses, Butterfly Fish, Surgeons, Big Eye Skad, Snappers, and more. For the diver that likes to go slow, you will also have frequent encounters with nudibranchs, scorpionfish, and octopus. This is an ideal dive site for beginners or people interested in smaller, more colorful animals. NAFTAN (B)- One of the best wall dives in the CNMI, with amazing visibility and fish live, located on the southern tip of the island. The top of the wall starts at 45 feet and goes down to over 130 feet. On the top portion, there are some great coral formations that are home to huge clams among other things. As one starts to descend on the wall, you will find magnificent fan coral and colorful animal life. Since this dive is at the edge of the abyss there is always the possibility of running into the larger fish like Napoleon Wrasses and Sharks. CHINSEN MARU (B)- Chinsen Maru is a large Japanese freighter that sits at 30 foot of depth in the lagoon. The ship has been in the water for over 50 years, allowing for some significant coral growth as well as becoming a home to thousands of fish. There are monstrous Red Snappers as well as Big Eye Emperors patrolling the wreck while huge schools of Goat Fish sit on top. The wreck is probably the best place on island to find Stonefish, several Stonefish call Chinsen home. To top it off a resident White Tip rests underneath the wreck. BANZAI CLIFF (B)- A beautiful wall located on the North side of the island. There is only a brief time during the year when conditions are suitable for diving, but it is well worth the wait if you like the big blue dives. Large pelagic fish such as sharks, rays, huge tuna, and dolphins are often seen. There are also amazing anemones and coral formations. This is an advanced dive due to the depths and currents. WING BEACH (B/S)- A fantastic dive that can be done from the beach or a boat. Wing Beach is located on the northwest part of the island. There are some great geographical features here, such as large crevasses and breathtaking drop-offs. This site is well known for shark encounters and Spanish Dancers at night. A drift dive from a boat is the best way to do this dive. GROTTO (S)- Considered by many as one of the best cavern dives in the world , this Must Do dive site in Saipan is sure to amaze you. After a giant stride into the water from a rock in the cavern, divers can take three different exit holes out to open ocean. Once outside, there are beautiful walls, swim-throughs, and caves to explore. Turtles and Clown Triggerfish are some of the many types of sea life to be seen at this magnificent dive site. Several resident White Tip Sharks lounge on the bottom during the day. OBYAN BEACH (B/S)- Located near Naftan Point, this site has some of the best visibility on the island. On a good day, there will be 150 + feet of visibility. After entering through the first reef, there is a beautiful patch reef with hundreds of small fish and some interesting animals to see. The second reef starts at about 50 feet where one finds Barracuda, sharks, and garden eels. 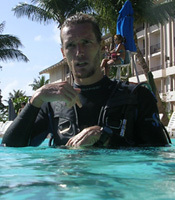 This dive site is ideal for all skill levels, especially people interested in photography. B-29/EMILY (B)- Okay, so the wreck is not a B-29 the name let you to believe, but that of a Japanese H8K or Type 2 Large Flying Boat. The Allied reporting name for this type of plane was Emily. The Emily was an Imperial Japanese Navy Flying boat used during World War II for maritime patrol duties. The 4 large props are still in tact as is most of the wing. The gun turret can been seen off the side. A chair and control panel lie close by. At 30 ft of depth this is an easy and relaxing dive. BOYSCOUT 1 & 2 (B/S) - Both Boyscout beaches are rarely visited by divers or anybody else for that matter, because they are hard to get to. Diver who go through the trouble are awarded with beautiful coral and white sand. Some of the largest clams can be found here. On a calm day you can do a surface swim from the second beach to Naftan and dive all the way back to the beach. RYUGUH - Saipan Newest divesite. Depth starts at 100ft. I refer to it as Saipan's Little Palau.